KANSAS CITY, Kan. — The Kansas secretary of state is on trial. Kris Kobach is defending the state's voter registration laws in two lawsuits that went to trial as a collective case Tuesday. The chief magistrate judge’s decision in the case could impact voter registration laws across the country. Kansas began following new rules regulating voter registration in January 2013. One law requires voters to show proof of U.S. citizenship when they register to vote at one of the state’s DMV locations. Acceptable proof includes items like a passport or birth certificate. Kobach said the goal of the law was to weed out voter fraud in the state. 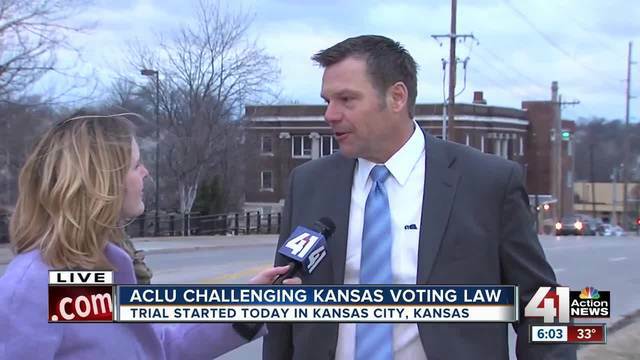 Groups like the American Civil Liberties Union (ACLU) and League of Women Voters filed suit arguing Kansas’ law is unconstitutional because it goes beyond the federal standards laid out in the National Voter Registration Act. The groups argued the rules are the “strictest in the country” and denied more than 30,000 legal Kansans the right to register and subsequently vote. Secretary Kobach is representing himself at the trial. He fired back during his opening statements saying the list of non-citizens his office has found on voter rolls is only the tip of the iceberg, highlighting why laws like the one in place are necessary. Eyes from across the country are focused on the trial, which is scheduled to last about a week. The judge’s decision could lead to changes that go well beyond the federal courthouse in Kansas City, Kansas. If Kobach wins, other states will have a precedent allowing them to implement their own voter registration laws that are stricter than the national standard. If the ACLU wins, it restores a federal standard over all the states; essentially maintaining an equal playing field for anyone registering to vote no matter what state they are in. Many supporters of the ACLU showed up to watch the trial. The courthouse staff set up an overflow room because the courtroom could not seat everyone interested in attending. One woman watching a live video feed of the trial in the overflow room was Lois Belser. She recently moved from Missouri to Kansas and admitted to being nervous when it comes time for her to register to vote at her new address. “A lot of people are being denied the right to vote because of intimidation and because of the faulty way that they do, the way they require documents,” Belser said. Also in the overflow room was 15-year-old Nina Baran, whose parents and teachers gave her permission to attend and watch. "People need to be able to express their voice. It's in the Constitution, and we can't hinder that in any way," Baran said. After opening arguments, the ACLU called several witnesses to the stand, including Kansas residents who tried to register to vote but were later put on a suspended or canceled voter list for failing to present the necessary documents. The plaintiffs' star expert testimony came from Dr. Michael McDonald, who holds a Ph.D. in political science and writes extensively on voter turnout. Through analysis of voter lists, McDonald said he found 35,000 people have been negatively impacted by the proof of citizenship requirement. In cross-examination, Kobach argued the analysis was faulty, not taking into account the fact that some people could have been on the suspended/canceled voter list because they simply moved out of state, chose not to complete registration or were not U.S. citizens. The defense also argued obtaining a birth certificate is not an undue burden. "I think the witnesses presented by the plaintiffs have some problems with their analysis. They're trying to say it's some unreasonable burden on Kansans to provide proof of citizenship when they register, but the evidence doesn't support that," Kobach said. The secretary added he is confident they can prevail over the ACLU's challenges either in this trial or in an appeals court. Key for Kobach's defense will be providing evidence of voter fraud. Since 2015 the secretary of state has prosecuted 9 people, one of whom was not a U.S. citizen. A judge, not a jury, will make a ruling in the case.